In Singapore, we spent most of our time staying indoor such as working in an office or sleeping in our house. Hence, the indoor air quality in our house and office is essential to our health. A clean and healthy environment is essential in any households or workplace in order to ensure a healthy environment to work or live in. We understand the importance of clean and healthy environment, hence, we are providing quality aircon servicing and repair for different types of McQuay aircon. With our wide range of McQuay aircon services in Singapore, we believe that we are able to become your one stop air-conditioning contractor in Singapore. You can contact us anytime to find out more about our aircon services. Regardless of the type of air-conditioning or brands, Wei Wei Aircon is able to provide quality servicing services, including McQuay aircon servicing Singapore. All of our technicians are fully trained and have the knowledge and experience in performing quality maintenance and servicing for your McQuay air-conditioning system. There are many benefits in servicing your air-conditioner units regularly, such as improve air flow, improve air quality, improve operating efficiency and many more. Thus, in order to upkeep the condition of your aircon system, make sure to engage professionals for regular servicing and maintenance. The lack of regular servicing can be detrimental to the condition and performance of the unit as the build-up of dirt and debris can affect the parts and components from operating efficiently and properly. The air-conditioner is one of the most complex machinery among the household appliances where it consists of different parts and components. Hence, the chances of your air-conditioner system encountering problems will be higher. Some of the common aircon problems faced by local households are such as aircon blowing warm air, aircon not working, aircon not cold, water leaking and many more. It is essential to rectify any aircon problems immediately to prevent the worsening of the issues. If the problems are not being fixed in time, it may cause a huge amount of repair fees in the future. Other than that, with the rising heat in Singapore, I am sure none of you want to endure the hot and suffering heat when your air-conditioning system is down. Therefore, always address any aircon problems due to safety reasons and also, to get your units back to working condition again. Besides providing quality aircon servicing and repair, we also provide quality aircon chemical washing services in Singapore. If your units are constantly operating for an extended hours a day, the dirt, dust and debris tend to build up in the units. Over a period of time, the condition of the units will deteriorate to a point where normal aircon servicing could not improve the condition. In this case, aircon chemical wash is one of the most effective aircon cleaning services that can improve the condition and performance. Chemical washing is a thorough washing process where it will flush and wash out all the dirt, dust, debris and even bacteria that have accumulated in the units. It is able to regain the cooling efficiency of your McQuay system as before, allowing you enjoy the strong cool air. McQuay aircon chemical cleaning has many benefits such as stronger airflow, increase cooling and operating efficiency, clear water leakage problem, reduce the possibility of system breakdowns, extend lifespan of your units and many more. With the increase in cooling and operating efficiency, it will reduce your power consumption, thus, allowing you to save on your energy bills in the long run. If your air-conditioner have not been regularly serviced or you have an extensive usage of your units and you find out that your aircon is not cold anymore. This may mean that your units require a chemical wash. Therefore, feel free to contact us to book a chemical wash Midea aircon appointment with us today. McQuay is another well-established air-conditioning manufacturers in Singapore. They have been in the air-conditioning industry for many years and have been manufacturing quality and reliable air-conditioner system for Singapore households. It is commonly used to fight against the hot heat in Singapore. Despite the reliability of the McQuay air-conditioning system, it is still required to have regular McQuay aircon maintenance to upkeep the condition and performance of the system. By having regular aircon maintenance, it will ensure that your units is being cleaned and serviced which will ensure the air quality is clean. Other than that, during our regular maintenance, our qualified technicians will carry out regular checks on your air-conditioning system. If there is any potential problems detected, our technicians will advise on the solutions to rectify the issues. It is one of the most crucial checks during maintenance as it will be able to detect and rectify aircon problems in its early stage. This will prevent the worsening of the aircon issues which may end up additional repair cost. Hence, in the long run, it will reduce the possibility of system breakdown issues and help you to save a substantial amount of repair costs in the future. Thus, always keep your air-conditioning system in good working condition by having regular Mcquay aircon maintenance services by professionals. Air-conditioner has been an essential electrical appliances in Singapore. We can see air-conditioner units being installed everywhere we go, including household, office, warehouse, shopping mall, cafe, church and many more. Due to the extreme heat in Singapore, we need to install aircon units in our home or office to keep us cool. However, it is important to engage a professional and certified aircon installer in Singapore to prevent potential aircon problems such as leaking issues, aircon not working and many more. At Wei Wei Aircon, we have years of experience in installing different types and brands of air-conditioner such as Mcquay split units, ceiling cassette, ceiling suspended, ceiling ducted. We also provide Mcquay aircon replacement services in Singapore. With years of experience in installation services in Singapore, we are confident that we are able to meet all your air-conditioning needs in Singapore. Regardless of the types or brands of your air-conditioner system in Singapore, during its lifespan, there will be problems or issues surfacing from your system. By having quality parts and components in your system will ensure the performance and efficiency of your air-conditioning system. Other than that, proper regular maintenance is crucial in maintaining a good working condition and at the same time, improve the lifespan of the system. Some of the common air-conditioner problems encountered by local households are refrigerant gas leakage, water leakage, weak air flow, aircon not cold, faulty parts, components and many more. 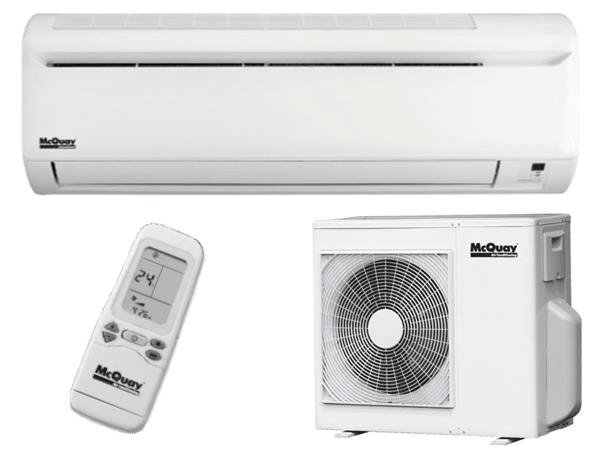 McQuay aircon units are no different from other brands where regular servicing is required to upkeep the performance and efficiency of the system. With our experienced technicians, together with appropriate tools and equipment, we are confident in servicing and repairing your McQuay units. Regardless what type of aircon problems you are facing, we are able diagnose the cause of the problems, rectify it and regain the functionality of your units. We have professional technicians that are experienced in servicing and repairing McQuay units in Singapore, thus, you can safely hand us your air-conditioning units for servicing or repair. Get your McQuay Aircon Serviced and Tuned Up Today! Regardless of the type or models of your McQuay aircon, we are able to perform quality servicing, repair, maintenance, chemical wash, installation and replacement services in Singapore. We are knowledgeable of the latest information in the air-conditioning industry so that we understand the different types and brands such as McQuay air-conditioning system. We understand the importance of the indoor air quality and comfortable cool environment as these results in a conducive environment for the workers at work and you and your family members at home. Hence, engage in quality McQuay aircon servicing regularly from professionals to improve the cleanliness of the indoor environment. Other than that, our qualified technicians are able to diagnose aircon problems, repair and fine-tune your air-conditioning system so that they are running efficiently. At Wei Wei Aircon, we believe that the quality of the air that we breathe is extremely crucial. In order to remain healthy, the indoor air quality must be clean. This can be done by performing regular aircon servicing where it will help to generate cool and clean air for your home or office. If you require any aircon services in Singapore, feel free to contact us for more information.